Today cook is in fashion. Celebrities share their secrets of homemade dishes in popular television programs: each channel has its own “culinary hour and a master at cooking all sorts of delicacies. Not to mention the fact that the Internet can find tons of recipes, video tutorials and forums dedicated to cooking. Designers also make their contribution to the development of this industry. 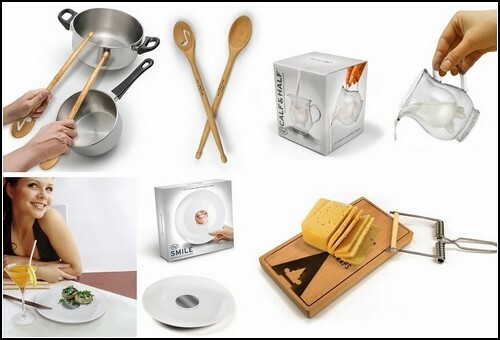 Thus, in today’s review – a compilation of the most unusual, funny and just wacky gadgets for the kitchen. After all, smile is the best seasoning. The original set of teacups, which do not look very friendly by their appearance… But if you put them in a column, you get a real shaman totem. The project is called Totem Cups. If you have rule in your family that everyone bakes their own Easter cakes, then you know that on the eve of the feast, all matching cups, jars and pots, are on the table and already they are preparing cakes of different shapes and sizes. And TeaCupcakes from designer Lou Henry, except tea or coffee, can also be cooked traditional muffins. Music lovers, especially fans of music in retro style, would think that this project is sacrilege. Is it possible to put a pot of hot soup or a cup of scalding coffee on a museum quality, like vinyl records? You can, if it is specially made props hotter Record Coasters and Hot Hits Pot Holders. it’s quite possible that no one will refuse such a gift… Even if he does not like milk and cream. They are certainly very attractive, these creative milkmen of Liz Goulet Dubois. “Take out your finger immediately out of your mouth!” commands the strict parent to his innocent children. And how to remove the finger, then, if the hand had just visited a jar of jam, a bowl of custard or ice-cream bowl with chocolate pudding? The designers do have their own answer to this question: finger in the mouth is the place to be. Especially if it is specifically for this purpose and is created by the author by the name of Sylvain Vanderhaegen, and it is called the Batter Finger. Another device, which will be more liked by kid than adult cooks. On the one hand, these are wooden spoons, and on the other – the drumsticks. Let’s see who is the biggest and most brilliant pothere? The project of Draft Mix Stix Designer from the designers Ignacio Pilotto and Jason Amendolara. How is it in my grandmother’s recipes? Take one teaspoon of this, half spoon of that, and salt, sugar and pepper – at the very tip of kitchen knives. And it seem that everything is clear, except that there are different spoons, and scoops someone with a slide, someone on a par with borders, but how much is the right one? It’s a bad job… Although, M-Spoons, spoon-dolls from the Design Winsor Pop, are able to help out from this trouble. Each of them has the capacity written on it, and folding them into each other out is more fun. Who voluntarily get into the trap, even if it has a delicious piece of cheese? Of course, silly careless mouse, or the same curious little cat… Or the one who is confident that it’s not a real mouse trap in front of him, whereas created by designers Sancho Hemelsoen and Jason Amendolara set of boards and cutters for cheese.